The KCA-iP200 USB Direct Connection Cable for iPod allows you to connect compatible iPods with a USB-equipped Kenwood head unit. 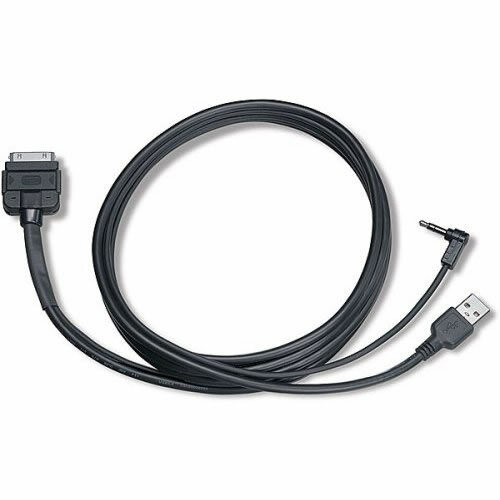 This cable enables the head unit to control and charge the iPod while connected, as well as enable high-speed iPod data communications of 12Mbps. This 2-meter cable has an iPod dock connector on one end and a Type A USB plug and 3.5mm stereo miniplug on the other end. The KCA-iP200 is compatible with Fifth Generation iPods (iPod with video) with software version 1.1.2 and iPod nanos with software version 1.2. If your iPod software version is older than those mentioned, you must update the software version from the iPod Updater on the Apple website.